I established my branding with this site design. The box, logo and slogan are used for all promotional material, and is clean and concise. The site includes a CGI-scripted online “Needs Assessment Questionnaire” , wherein the potential client answers questions about their web/business needs. 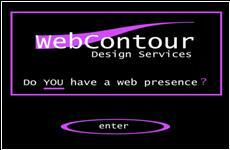 The site needed to not only be visually pleasing, but serve all my potential and current client needs. The “Current Clients” page promotes my work and has password-protected directories to enable clients to view their sites before they are uploaded to the appropriate servers.